Earlier this year, L.A. beatsmith Flying Lotus took a break from his bizarre post-hip-hop production to direct a music video for Erykah Badu's "Gone Baby, Don't Be Long." It now looks as though the pair might be moving toward BFF status, as the collaborations aren't stopping there. Pitchfork reports that Flying Lotus is currently working on new material with Badu. 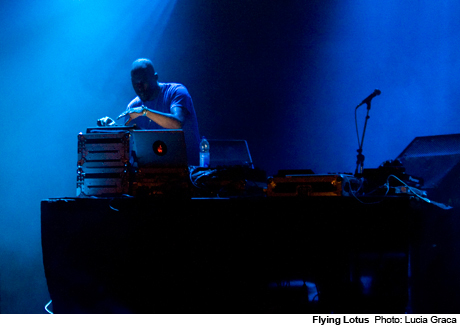 While the details are vagure, Lotus revealed the plan onstage during a show at the University of Southern California. On Monday (April 11), he confirmed these plans on his Twitter, writing, "Waiting for Badu to get here so we can start Day 1 of our project together." But the fun doesn't stop there. On Sunday (April 17), Badu will join Flying Lotus, Gaslamp Killer, Peanut Butter Wolf, Madlib and many others for the Coachella Stones Throw x Brainfeeder Party. Badu will be one of many artists contributing DJ sets. More information is available here.